Oh dear! Oh dear! Oh dear! So the Brent crude price sank to a weekly loss last week; the first such instance in roughly a month. Is the Oilholic surprised? Not one jot. What yours truly is surprised about is that people are surprised! One sparrow does not make spring nor should we say one set of relatively positive Chinese data, released earlier this month, implies bullish trends are on a firm footing. The Chinese news was used as a pretext by some to go long on the Brent forward month futures contract for March as it neared its closure (within touching distance of US$120 per barrel). And here we are a few days later with the Brent April contract dipping to a February 15 intraday price of US$116.83 on the back of poor industrial data from the US. The briefest of spikes of the week before was accompanied by widespread commentary on business news channels that the price would breach and stay above the US$120 mark, possibly even rise above US$125. Now with the dip of the past week with us, the TV networks are awash with commentary about a realistic possibility that Brent may plummet to US$80 per barrel. You cannot but help laughing when spike n’ dips, as seen over the past few weeks, trigger a topsy-turvy muddle of commentators’ quotes. Sometimes the Oilholic thinks many in the analyst community only cater to the spread betters! Look at the here, the now and have a flutter! Don’t put faith in the wider real economy, don’t examine the macroeconomic environment, just give a running commentary on price based on the news of the day! Nothing wrong with that, absolutely nothing – except don’t try to pass it off as some sort of a science! This blogger has consistently harped on – even at times sounding like a broken record to those who read his thoughts often – that the risk premium provided by the Iranian nuclear standoff is broadly neutral. So much so, that the reason the Brent price has not fallen below US$100 is because the floor is actually being provided by the Iranian situation on a near constant basis. But that’s where it ends unless the country is attacked by Israel; the likelihood of which has receded of late. Syria’s trouble has implications in terms of its civil war starting a broader regional melee, but its production is near negligible in terms of crude supply-side arguments. Taking all factors into account, as the Oilholic did last month, it is realistic to expect a Brent price in the range of US$105 to US$115. To cite a balanced quote, Han Pin Hsi, the global head of commodities research at Standard Chartered bank, said that oil should be trading at US$100 per barrel at the present moment in time were supply-demand fundamentals the only considering factors. In recent research, Hsi has also noted that relatively lower economic growth as well as the current level of tension in the Middle East has already been “priced in” to the Brent price by the wider market. Unless either alters significantly, he sees an average price of US$111 per barrel for 2013. Additionally, analysts at Société Générale note that along with the usual suspects – sorry bullish factors – now priced in, Brent could see some retracement on profit-taking, though “momentum and sentiment are still bullish”. The French bank’s analyst, Mike Wittner, notes that just as the Saudis have (currently) cut production, concerns over prices being “too high” will cause them to increase production. “In short, our view is that Brent has already priced in all the positive news, and it looks and feels toppy to us,” he wrote in an investment note. “Toppy” – like the expression (slang for markets reaching unstable highs whereupon a decline can be expected if not imminent)! On a related note, in its short-term energy outlook released on February 12, the EIA estimates the spread between WTI and Brent spot price could be reduced by around 50% by 2014. The US agency estimates that the WTI will average US$93 and US$92 in 2013 and 2014 respectively, down from US$94 in 2012. It expects Brent to trade at US$109 in 2013 and edge lower to US$101 in 2014, down from the 2012 average of US$112. Elsewhere in the report, the EIA estimates that the total US crude oil production averaged 6.4 million barrels per day (bpd) in 2012, an increase of 0.8 million bpd over 2011. The agency’s projection for domestic crude oil production was revised to 7.3 million bpd in 2013 and 7.8 million bpd in 2014. Meanwhile, money managers have raised bullish positions on Brent crude to their highest level in two years for a third successive week. The charge, as usual, is lead by hedge funds, according to data published by ICE Futures Europe for the week ended February 5. Net-long positions, in futures and options combined, outnumbered net-short positions by 192,195 lots versus a figure of 179,235 the week before; a rise of 6.9% according to ICE’s latest Commitment of Traders report. It brings net-long positions to the highest level since January 2011, the month the current data series began. On the other hand, net-short positions by producers, merchants, processors and users of the crude stuff outnumbered bullish positions by 249,350, compared with 235,348 a week earlier. It is the eighth successive weekly increase in their net-short position, ICE Futures Europe said. Moving away from pricing matters, a few corporate snippets worth flagging up - starting with Gazprom. In a call to investors and analysts earlier this month, the Russian state energy giant finally appeared to be facing-up to greater competition in the European gas market as spot prices and more flexible pricing strategies from Norway’s Statoil and the Qataris put Gazprom’s defence of its conventional oil-indexation pricing policy to the test. Gazprom ceded market share in defence of prices last year, although it did offer rebates to selected customers. However, it appears to be taking a slightly different line this year and aims to cede more ground on prices in a push to bag a higher market share and prop up its overall gas exports by volume. Gazprom revealed that it had paid out US$2.7 billion in 2012 in refunds to customers in Europe, with the company planning another US$4.7 billion in potential price cuts this year in order to make its pipeline gas prices competitive with spot prices and incentivise European customers to make more voluminous gas purchases. “Rather than continuing to react to changing market conditions by offering lower prices to customers, Gazprom may need to take a more proactive approach to reducing its gas export prices in order to incentivise customers to buy more gas from the Russian gas firm this year,” they concluded. Finally, TAQA, the Abu Dhabi National Energy Company, said in a statement over the weekend that a new oilfield has been discovered in the North Sea. It reported that two columns of oil have been found since drilling began in November at the Darwin field, about 80 miles north-east of the Shetlands. The field is a joint venture between the Abu Dhabi state-owned company and Fairfield Energy. 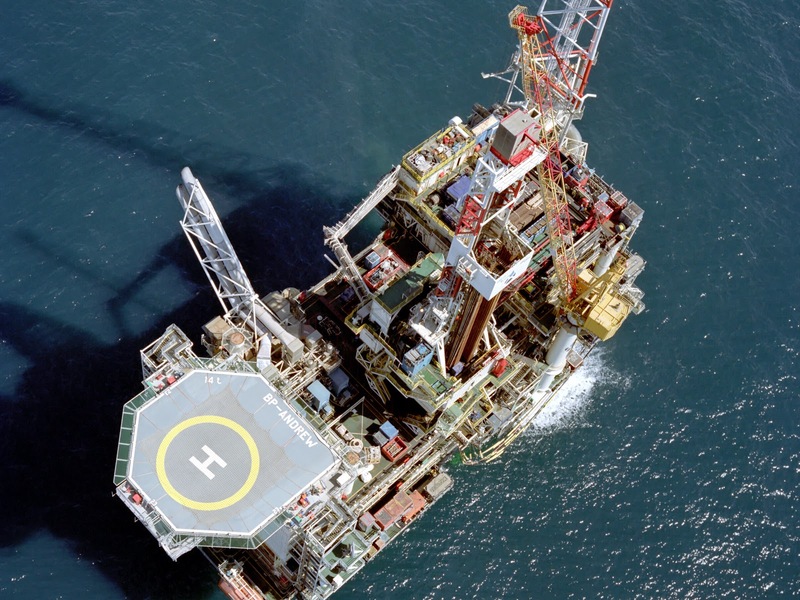 TAQA acquired some of BP’s North Sea assets for US$1.1 billion in November 2012. That’s all for the moment folks! Keep reading, keep it ‘crude’! © Gaurav Sharma 2013. Photo: Andrew Rig, North Sea © BP. Graph: World crude oil benchmarks © Société Générale Cross Asset Research February 14, 2013. Oh boy, what one round of positive data, especially from China, does to the oil market! The Brent forward month futures contract for March is within touching distance of a US$120 per barrel price and the bulls are out in force. Last Friday’s intraday price of US$119.17 was a nine-month high; a Brent price level last seen in May 2012. The cause – and you have heard this combination before – was healthy economic data from China, coupled with Syrian turmoil and an Iranian nuclear stalemate. The Oilholic has said so before, and will say it again – the last two factors touted by market commentators have been broadly neutral in terms of their impact for the last six months. It is the relatively good macroeconomic news from China which is principally behind the rally that nearly saw the Brent price breach the US$120 level. The bull-chatter is already in full force. In a note to clients, Goldman Sachs advised them last week to maintain a net long position in the S&P GSCI Brent Crude Total Return Index. The investment bank believes this rally is "less driven by supply shocks and instead by improving demand." "Global oil demand has surprised to the upside in recent months, consistent with the pick-up in economic activity," the bank adds in an investment note. Really? This soon – on one set of data? One thing is for sure, with many Asian markets shut for the Chinese New Year, at least trading volumes will be lighter this week. Nonetheless, the ‘nine-month high’ also crept into the headline inflation debate in the UK where the CPI rate has been flat at 2.7% since October, but commentators reckon the oil spike may nudge it higher. Additionally, the Brent-WTI spread is seen widening yet again towards the US$25 per barrel mark. On a related note, Enterprise Product Partners said that capacity on its Seaway pipeline to the US Gulf of Mexico coast from Cushing, Oklahoma will remain limited until much later this year. Moving away from pricing, news arrived end-January that the inimitable Aubrey McClendon will soon vacate the office of the CEO of Chesapeake Energy. It followed intense scrutiny over the last nine months about revelations, which surfaced in May, regarding his borrowings to finance personal stakes in company wells. As McClendon announced his departure on January 29, the company’s board reiterated that it had found no evidence to date of improper conduct by the CEO. McClendon will continue in his post until a successor is found which should be before April 1st – the day he is set to retire. 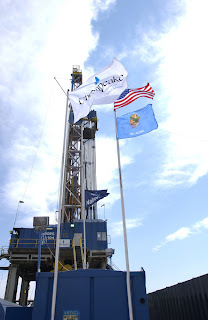 The announcement marks a sad and unspectacular exit for the great pioneer who co-founded and led Chesapeake Energy from its 1989 inception in Oklahoma City and has been a colourful character in the oil and gas business ever since. Whatever the circumstances of his exit may be, let us not forget that before the so called ‘shale gale’ was blowing, it was McClendon and his ilk who first put their faith in horizontal drilling and hydraulic fracturing. The rest, and US’ near self-sufficiency in gas supplies, is history. Meanwhile, BP has been in the crude news for a number of reasons. First off, an additional US$34 billion in claims filed against BP by four US states earlier this month have provided yet another hurdle for the oil giant to overcome as it continues to address the aftermath of the 2010 Gulf of Mexico oil spill. However, Fitch Ratings not believe that the new round of claims is a game changer. In fact the agency does not think that any final settlement is likely to be enough to interfere with BP's positive medium term credit trajectory. The latest claims come on top of the US$58 billion maximum liability calculated by Fitch. If realised, the cost of the spill could rise up to as much as US$92 billion. The agency said the new claims should be put in the context of an asset sale programme that has raised US$38 billion. “This excludes an additional US$12 billion in cash to come from the sale of TNK-BP this year – upside in our analysis because we gave BP no benefit for the TNK-BP stake. BP had US$19 billion of cash on its balance sheet at 31 December 2012. That is after it has already paid US$38 billion in settlements or into escrow,” it added. Away from the spill, the company announced that it had started production from new facilities at its Valhall field in the Norwegian sector of the North Sea on January 26 with an aim of producing up to 65,000 barrels of oil equivalent per day in the second half of 2013. Valhall's previous output averaged about 42,000 barrels per day (bpd), feeding crude into the Ekofisk oil stream. Earlier this month, BP also said that both consortiums vying to link Azerbaijan's Shah Deniz gas field in the Caspian Sea, into Western European markets have an equal chance of success. BP operates the field which was developed in a consortium partnership with Statoil, Total, Azerbaijan’s Socar, LukAgip (an Eni, LUKoil joint venture) and others. BP is aiming for the first gas from Shah Deniz II to be delivered to existing customer Turkey in 2018. Early 2019 is the more likely date for the first Azeri gas to reach Western Europe via this major development often touted as one which would reduce European dependence on Russia for its energy supplies. The Shah Deniz consortium owns equity options in both the pipeline projects and Cook did not rule out that both Nabucco (West) and TAP could be built in the long term. Specifically, BP's own equity options, which are part of the Shah Deniz stakes, are pegged at 20% in TAP and 14% in Nabucco. Cook said BP was not “actively seeking” to increase its stake in either project – a wise choice indeed. On February 4, BP said its Q4 2012 net profit, adjusted for non-operating items, currency and accounting effects, fell to US$3.98 billion from US$4.98 billion recorded over the corresponding quarter last year. Moving away from BP, Royal Dutch Shell posted a 6% dip in 2012 profits to US$27 billion on the back of weak oil and gas prices and lower exploration and production (E&P) margins. The Anglo-Dutch oil major reported Q4 earnings of US$7.3 billion, a rise of 13%. However, on an adjusted current cost of supply basis and one-off asset sales, the profit came in at US$5.58 billion. In particular, Shell’s E&P business saw profits dip 14% to US$4.4 billion, notwithstanding an actual 3% increase in oil and gas production levels. However, the company did record stronger refining margins. Ironically, while acknowledging stronger refining margins, Shell confirmed its decision to close most of its Harburg refinery units in Hamburg, Germany. The permanent shutdown of much of its 100,000 bpd refinery is expected next month in line with completing a deal made with Swedish refiner Nynas in 2011. Finally, in a typical Italian muddle, several oil executives in the country are under investigation following a probe into alleged bribery offences related to the awarding of oil services contracts to Saipem in Algeria. Eni has a 43% stake in Saipem which is Europe’s biggest oil services provider. While the company itself denied wrongdoing, the probe was widened last Friday to include Eni CEO Paolo Scaroni. The CEO’s home and office were searched as part of the probe. However, Eni is standing by their man and said it will cooperate fully with the prosecutor’s office in Milan. So far, Pietro Franco Tali (the CEO of Saipem) and Eni’s Chief Financial Officer Alessandro Bernini (who was Saipem’s CFO until 2008) have been the most high profile executives to step down in wake of the probe. Watch this crude space! That’s all for the moment folks! Keep reading, keep it ‘crude’! © Gaurav Sharma 2013. 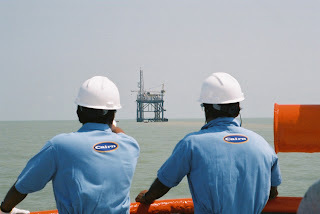 Photo 1: Asian oil rig © Cairn Energy. Photo 2: Gas extraction site © Chesapeake Energy.